While I was making beads, I got a little silly and made this little bee. I also tested a few combinations for fun and to see if some colors were happy working with one another. Green and yellow is very tricky. These were sets that I was putting together for largesse, however, due to the Lampworker's Guild needing more beads made, they got re-allocated to that project. Just means I need to make MORE BEADS! I'm looking forward to teaching my beginner's class in a couple weeks! I think it's going to be very popular and my co-teacher and I are going to have to try to get many people to work the torches, and hopefully they'll be able to make at least one bead each. In a conversation tonight, I thought I'd put a little bit of my Beginner's Lampwork information here for you to peruse. Equipment: Here's a list of the things you will need to start bead making. 2. Hot Head torch. This piece is necessary for melting the glass at the right temperature. Craft torches and things you get at those home hardware places will burn your glass and turn it grey and gross looking. 8. A cookie sheet with a lip on it. 11. 1 gallon bucket. An ice cream bucket is the perfect size. Just what you needed--an excuse to buy a bucket of ice cream! Go ahead...eat it while you read. 12. Fine grain vermiculite. Found in your local garden department. You can get a small bag of it and share it between a couple lampworkers. 14. Mandrils. These are the metal rods that you need to dip into the Bead Separator. I would start with small ones, like 1/16". 15. Glass rods. It's VERY important that you get glass that has the same COE (coefficient of expansion) or you will end up with broken and cracked beads. Most lampworkers use 104 COE. It seems like an extensive list, but a lot of it is little things that you might even have kicking around your garage. The rest you can mail order or pick up at your local hardware store. www.Frantzartglass.com. They're located in Shelton, WA, will pack up your order quickly and bubble wrap the heck out of it! If you have questions or concerns, they get back to you fast to help you. I can't say enough nice things about them! Marvers, Probes, Picks and Rakes: other tools you can search for that can help you make fun shapes and manipulate glass. This is for the 201 class, however... You can pick up a cheap set of dental tools that you can start with--just remember that the metal has to stay cool or the glass will stick to it. You can find videos on YouTube on how to make glass beads. As you can see, I did a little hat making over the last couple of days. After attending May Crown a couple weeks ago, it came to my attention that a few of my garments needed some repairs and upgrades. One shift needed a longer neckline--it was cutting me off at the throat. One shift had a couple of seams that had popped--one on the arm and one in the armpit. Then the apron dress...linen...gorgeous color...entirely sewn by hand...and the thread was not strong enough, so it snapped in a couple places. After making all those repairs, I decided to beef up my 12th century outfit, just in case I have occasion to wear it in the near future. I usually do something in the Viking sphere or something a little later period, like Flemish peasant. Since we just finished the polling two days ago, and my coronet candidate partner is 12th century, I am trying to keep a positive attitude for the outcome and be prepared for the season. 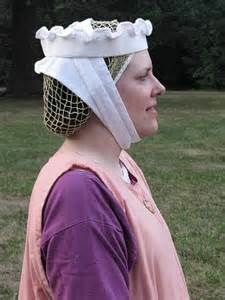 I wanted us to dress in matching eras, although my garments might lean a little toward the 13th century instead of 12th. I took the mustard-yellow gown that I made a couple years ago. It had shrunk horribly in the wash, so what was a floor-length gown was suddenly...very short. After a short debate, I decided to add gores to the front and back to add fullness. Then I added 8" of brown fabric to the bottom...I may add some embroidery at some point, although that may be some time from now. 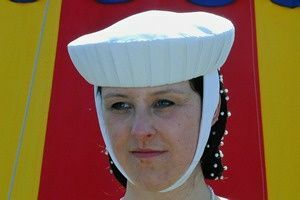 I have several bits of linen scraps that I can use to make some of these hats. 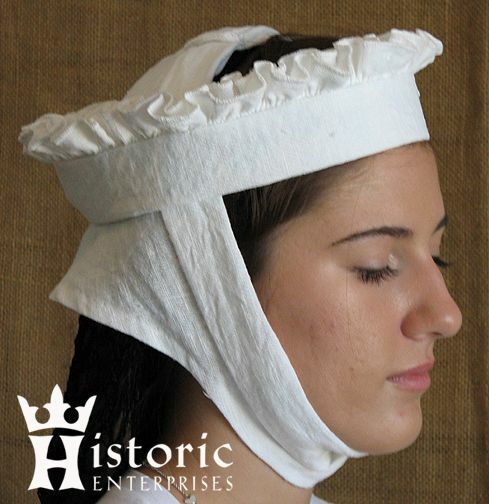 I'm not sure I agree with the shape of the "barbette", the layer under the hat and chin strap; I think it might have simply been a coif. I'll have to make some pieces and see how it looks. I also want to learn how to make netting for a snood, like the lady in the purple on the far right. It reminds me of some of the hairnets that were in fashion off an on through the 1950s...but I need to make a barbette to go with it. By the way, if you Google "Barbette" you come up with a drag queen from the 1920s. Just...FYI. We want to encourage education in Aquaterra. The people of Aquaterra have a great passion for knowledge. At the end of 2013, Elewys proposed the start of classes for Ithra credit at Aquaterra’s monthly socials. Working with Emma Compton, Aquaterra’s A&S champion, these classes have been immensely popular. We want to continue in this vein by supporting more workshops and classes. We’d like to welcome dance classes and more hands-on activities at our socials, utilizing the knowledge of the members of the populace and embracing the interest expressed through increased attendance at the socials. We also want to support Art of War and its new rapier track. This is a great opportunity for Art of War to grow and include more members of the Kingdom population. Perhaps by this support we will be able to increase rapier interest in the Aquaterra populace and improve the participation at the rapier championship. We would like Aquaterra to work more collaboratively with the Canton of Bearwood. The Canton is comprised of a small group of talented, warm, welcoming people that have created a community of kindness and inclusion. Yet the relationship between Aquaterra and Bearwood hasn’t been very collaborative in several years. We would like to build that relationship, which would benefit both communities. We believe that we need to streamline Aquaterra’s events to revitalize our community. Aquaterra is struggling with a problem many SCA communities face at some point: the participant pool has diminished, and the same small number of people shuffle around the officer and event steward positions. This leads to burnout, and cycles between the group further diminishing and reliance upon a smaller participant pool. In order to face this challenge, we believe that an analysis and streamlining of Aquaterra’s events is necessary. There is great love for each of the events Aquaterra hosts, yet we have an unusual task of taking on an imposing public event annually. Ursulmas draws upon a pool of participants for six to 12 months to organize this massive tournament, which can limit the energy and ability of those participants for other events, both within and outside of our borders. Additionally, the average barony in An Tir hosts 4 annual events. Aquaterra hosts six annual events, supports the Canton’s three annual events, plus is a crucial participant in the Shire of Shittimwoode’s Warren War. We believe a full and frank discussion is necessary with the populace. We, as a community, need to identify our priorities, strengths, needs, and how we’ve been faring the last few years, in terms of volunteerism, participation, and financial viability. We don’t want to dictate to the community what events to discontinue - we believe that if the decision is made, it needs to be made by the people of Aquaterra. We want to improve the event steward process to build a community of knowledge.Each year, event stewards face a challenge of trying to glean lessons from previous event reports and event bids. Frequently knowledge is lost from year to year. In the past, there was a team of event stewards working on Ursulmas that created a ‘master and apprentice’ relationship for each role. This was a helpful and sustaining method. We think an amalgamation of the event bid process and the ‘master and apprentice’ process could create a stronger event steward team. We would like to have our event steward teams to utilize learning notebooks which contain all the materials from the bid sheet to the final event report, which can be passed on to the next year’s event team to learn from and digitized to prevent loss. We also want to create an ‘expectation of education’, in which the previous year’s event stewards are resources to the current year’s event stewards.We would like to build stronger relationships with other Baronies in An Tir. Aquaterra is blessed to be geographically close to so many incredible Baronies. And we, Elewys and Aenor, would like Aquaterra be known as an active friend to those around us. The North Sound Sergeantry trials have been a wonderful step in that direction, but we could do more. We would like to build treaties with our neighbors, in which we support each other with volunteers for events - large or small. One of the problems our barony has faced is that we are an insular crowd. By stepping out of our comfort zone and building stronger ties with the communities around us we can expose ourselves to greater ideas. This could do so much to grow and better our community and ourselves.  We can host Kingdom guild competitions at Kingdom-wide events, such as the Kingdom Costumer’s Guild, Kingdom Embellishers Guild, or the new Kingdom Apothecary Guild.  We could have Kingdom largess-making competitions and parties to help spread the skills of Aquaterra artisans across the Kingdom, as well as replenish the diminished largesse coffers.  We would like to help Aquaterrans have a ‘home away from home’ at events hosted outside our lands. We want to promote the Aquaterra camping area with a fire hosted by the Baronesses, in which anyone, Aquaterran or not, can join the circle. We can also foster a larger community by hosting a potluck breakfast or Stone Soup lunch at ‘away events’ for anyone wanting company or a meal to join.  Some populace members miss out on events outside Aquaterra because of the limitation caused by distance. We could create ‘get to know you’ opportunities at the monthly socials for people looking for a ride to an event (or people to camp with) to meet others attending said events that are willing to open their camps and transports. This would allow attendees to connect and build relationships before hitting the road. We also would like to have the Barony recognize the accomplishments Aquaterrans made outside the barony. We would like to publically recognize these accomplishments, such as winning competitions, teaching at events, and awards given by Their Majesties and other branches. We could accomplish this in the Murmurs newsletter, the Aquaterra web site, and other social media. We would like to improve Aquaterra’s presence in the greater Snohomish County community. Just as Aquaterra is part of the larger Kingdom community, we are part of the larger Snohomish County community. There is an interest and a compassion in our people for the community of the modern world. In December 2014, Aenor organized with Baroness Sineadin a toy and food drive for HelpLink of Snohomish County. The outpouring of donations demonstrates how much interest is present. Additionally, in July 2014, Aenor worked with United Way of Snohomish County to create a donation station at the Bill and Melinda Gates Foundation’s annual employee picnic for victims of the Oso mudslide. With the connections we have in our modern communities, there is a lot of good we Aquaterrans could do for our neighbors. We, Aenor and Elewys, have discussed opportunities for toy and game drives for Seattle Children’s Hospital and other fundraisers. Communicate with former members and members not currently active in the barony. Aquaterra has suffered, over the last few years, a ‘mass exodus’ of a large portion of our Sergeants and other members of the populace. We know that some wounds cannot be healed, but we, Elewys and Aenor, want to reach out to these people and learn from past mistakes. Every person in Aquaterra deserves the chance to be heard, whether they currently play in the Barony or not. We want to hear their grievances, hear their advice, and ask them what would make them consider coming back. There is also a greater group of SCA participants that don’t play on the baronial level. This ranges from knights to merchants to people interested in larger events. We would like to ask what they, too, want from the SCA, and if Aquaterra could possibly provide it. We want to provide ‘market research’ for Aquaterra. We want to hear the thoughts and ideas and criticisms of the people, and use those to build and shape the Aquaterra that they want to be in. What have people liked over the past few years? What have they not liked? What do they miss? What do they see in other branches that they would like to see here? At the core of the job, the Baronet of Aquaterra is a servant to the populace. Though we have our own ideas and visions, we want to respect the visions of our people. We want to help each person build the community that will continue on, long after we have stepped down. We want to create a community of open communication. A coronet is an intimidating thing. It is a symbol of office and responsibility, but it is also a barrier that often prevents honest dialogue. With this in mind, we would like to host quarterly Parliaments--open discussions-- with the people. These “bare-head” nights will be in a public area, so each person feels like they are on equal ground. And on these nights, we, Aenor and Elewys, will literally and symbolically remove our coronets and hear the voices of the people. It’s a night in which people can feel free of the intimidation of the headgear and can speak to us as equals, with no fear of reprisal. Any populace member wanting to discuss a topic can decide if they want the discussion to be public or private. And the topics can range from issues with the coronets to mediations between populace members. This is an opportunity for the populace to drive the conversation, not rely on an agenda compiled in advance. We want to hear the populaces’ criticisms as well as accolades. It’s only through this open and honest dialogue can we keep our community healthy and strong. We want to learn from other communities in An Tir and the Known World. We aren’t experts, and we aren’t all-knowing. But there are skills and experience in so many people across An Tir. We want to go to Madrone’s curia and just sit in the back and learn from what we see and hear. We want to ask other coronets their opinions on Aquaterra and what solutions and ideas they think would be good to bring home to our branch. We also want to build dialogue with contacts outside An Tir. 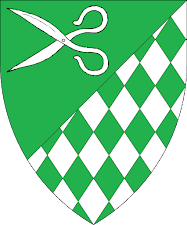 We would like to contact Baronets from across the Knowne Worlde; from the Kingdom of the West to the Kingdom of Drachenwald. We want to bring their fresh ideas to liven our community, and share with other branches of An Tir. We are servants of our Kingdom and our Barony, no matter our titles and achievements. Each person has the power to impact the health and life of our Kingdom and branch. But with the opportunities provided by the Baronet, we, Aenor and Elewys, could help Aquaterra achieve great changes and great growth. With this vision of our path, we could certainly do amazing things. I bought a spinning wheel, a Lendrum single treadle, and finally started in ernest to wash the fleece given to me by HL Godith from her flock. It was shorn 9 years ago and I have been happily turning fluffy stuff into yarn over the past few weeks. The last spool of white is not pictured...it was on the wheel. I unspooled the pink, got it wet, and am blocking it now (by hanging a 20 oz. bottle of Gatorade on it), so I can start spinning spool #7. After that, I'll have to skein up the spools so I can spin some more. All this spun yarn is destined to become a piece of cloth to be made into a garment--my first sheep-to-shawl project (not that it'll be a shawl, but some wearable garment, probably an overtunic. For the Perfectly Period Feast in An Tir, I made this ensemble (left) for the 1470s era Italian Renaissance Feast. Pictured with me is my bestie, Aenor, who is running as my Sister-Baroness for our Barony. We won't be the first girl-girl pairing, but the first in our Kingdom. Not only is this an exciting prospect for us, but for Inspirational Equality. Not that we're in that kind of relationship--we are both very happily involved with our respective men (who, I swear, must have been separated at birth!) --we're just friends. It's been a little while since I did any posts, so I guess I have some catching up to do! Most recently, I did a commission piece for my old friend, Don Miguel. He's constructing a new Elizabethan outfit and wanted a little something to add to the garment--something hand made by a friend is always better than factory made by a stranger. This is a 2 yard piece and I hope to get it to him soon! After finishing up a couple quilt projects and helping the middle kid with Girl Scout cookie sales, I started this very tiny, delicate trim from Applesies and Fox Noses. This one is called "Bee Feet" and will be 4 yards long when complete. It's made from size 10 perle cotton--the kind you can get by the spool at any craft store (Michael's, Joann's, etc.). I ended up using 2 spools of each color for the 16 cards. The weaving itself is only 1/2" wide, is very silky and flexible. This will be great for trim for a tunic. I have a great desire to work on some beads or some spinning on my new wheel...and of course, I'm laid up with an infection on my leg. I'm supposed to keep my leg elevated and I'm taking some serious antibiotics and anti-inflammatories, and it's difficult to do any kind of arts with my feet up. Knitting...but I'm not really feeling like knitting, and keeping a pattern nearby...never mind. I'll blog and check Facebook. Hopefully I'll be back to normal in a few days.